Happy Weekends guys! 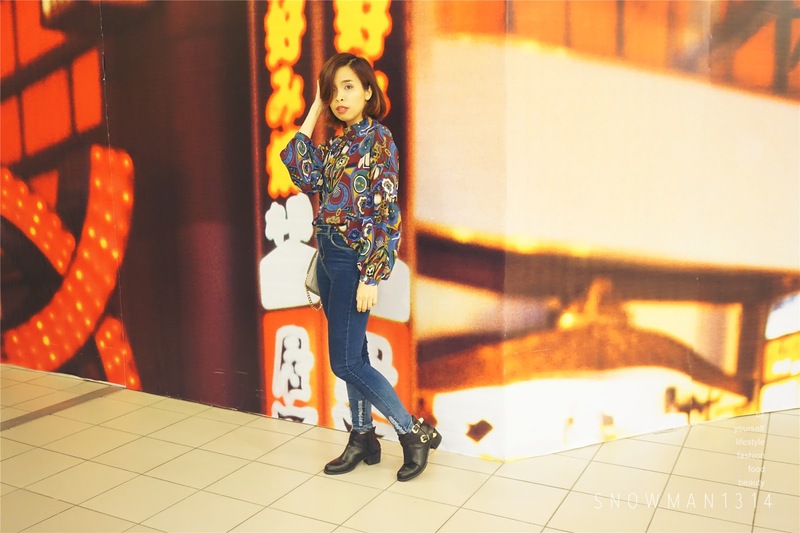 I have not been blogging my outfit post for the past 2 weeks. This time I will blog about my outfit I wear during last month too. Usually I don't really wear jeans during weekend because I have been wearing jeans during weekdays to work. But sometimes when I couldn't find any bottom to match with my top, I will usually just grab my jeans and match with it. 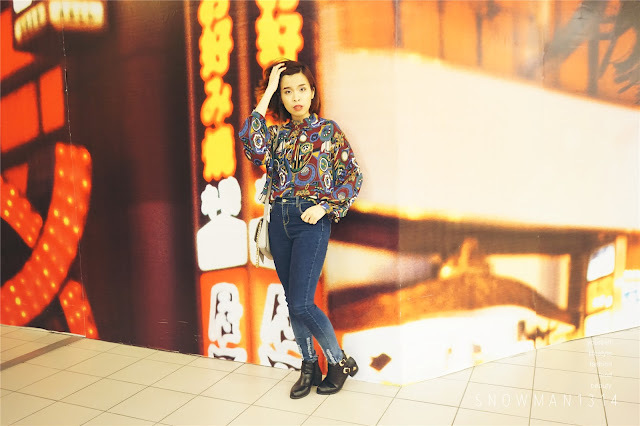 This outfit is the combination of vintage print and casual jeans look. When my boyfriend actually saw this top, he complains that why am I buying this weird print Indiana prints. He doesn't really like this top at all. haha! I bought this because I always have many plains top with only plains color so I decided to get some fun prints to try on. When I try this top, my boyfriend find it was perfectly fine on me LOL. Close details of the prints, actually when I saw this top online the color was actually more to darkish purple which I really like. But it was actually mix with quite lots of color and with random shape and prints on the top. The cutting was quite big and I really like it, the sleeve was not according to my shoulder length but is over size design and puffy sleeve too. 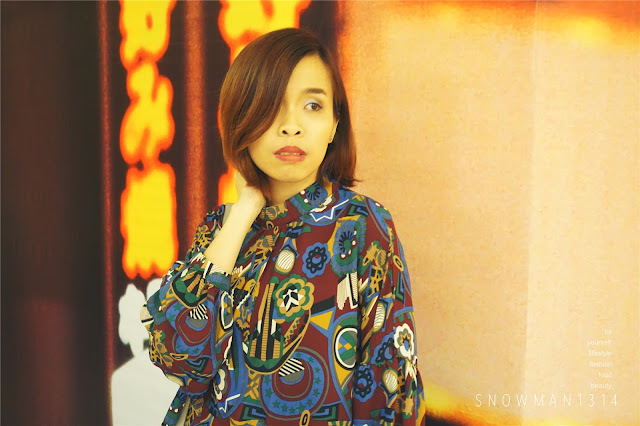 Over size and Puffy design makes me look more slim and helps cover fats of my body and arms too. Material wise is really comfy and cooling, love love it so much! Make up of the day. Trying Purple and Smokey Eye Look but sadly I only have pastel purple which it doesn't really see clearly the color. Can't wait to receive my new eye shadow palette with lots of fun color for me to play with! Using my first Matte Lipstick From L.A Girl, color Rebel. Slightly purplish and the color match with my top too. Matte Lipstick is not easy to apply as they have to apply precisely according to your lip outline, if not if you didn't apply nicely you will find the color is unbalance and not clean. It was a challenging lipstick but ever since I try on Matte Lipstick, I find that I have fall in love with Matte Lipstick. Love it! Jeans and Boots is always perfect match for each other. This jeans is a gradient jeans which I find it quite interesting. 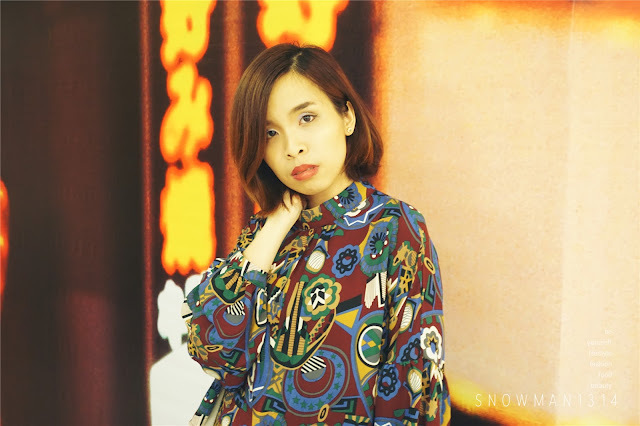 If you wondering how I always got my clothes from Taobao or Twmall, is all through Ezbuy. I been using their website for over 3 years and I always trust their service and delivery was always very fast. Interested to know more? Click here to sign up and get your order from Ezbuy. Yes I understand that feeling too, have to read and measure the size nicely. the top actually looks really good!! I don't know if I can pull off this type of look anot. But it looks great on you! 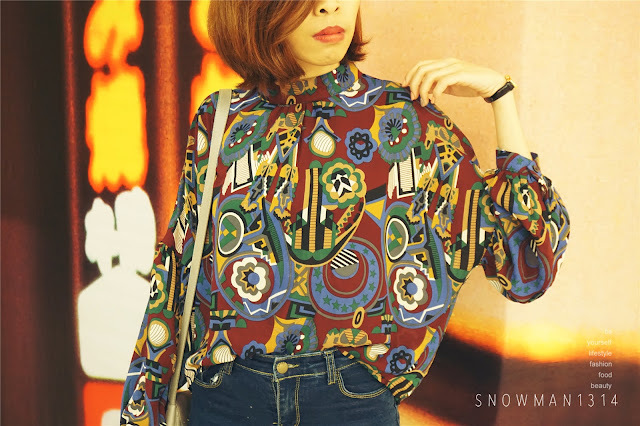 Vintage Print Top looks good on you. A perfect match with your jeans. you look good with the vintage print shirt! keep up the good work yo! 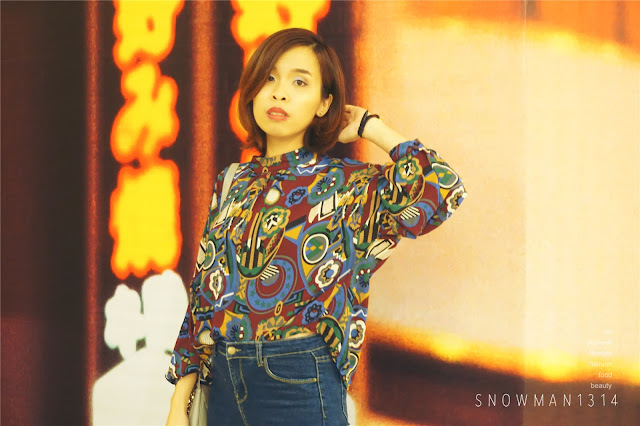 i love the top..the print and the cuts.. really suit with my style too..
Yay go vintage, is a trend now :) Between, saw ezbuy many times but didn't know they have such good service on taobao. Nice vintage look :D And you pictures are perfect!! love the outfit especially the shirt and booties. that shirt is mesmerizing. Rocking that shirt like it was made for you. The print on the blouse you're wearing are really vintage! The colour combination is really nice. Thank you for the information. This is really useful - the EZbuy service. Now I will less headaches when it is time to buy gifts. So much choices at my fingers tips and door step delivery. Competitive prices too. wow! I love your outfit :D a perfect match of tee and pants. You look great in anything. I personally prefer the print to be of lighter colour. It's too dark now, hence would look old on me. Very vibrant print! Skinny jeans also look good.